The significantly lower unrealized loss on AFS securities primarily resulted from: 1) a smaller total market value of AFS securities, 2) a lower average duration for the AFS securities, and 3) a smaller increase in the market yields of the AFS securities. However, the lower unrealized loss was partially offset by a decrease in interest revenue on U.S. Treasury obligations that resulted from lower inflation compensation on Treasury Inflation-Protected Securities. 1 As of September 30, 2006. 2 Commercial banks and savings institutions. Does not include U.S. branches of foreign banks. The FDIC has had an exceptional record of controlling operating costs over the past five years, and 2006 was no exception. 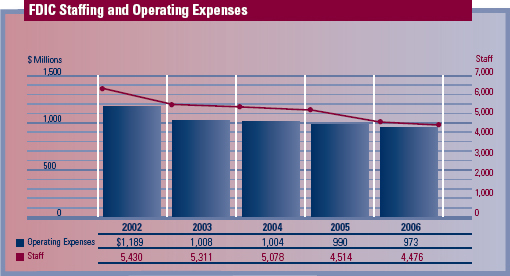 Corporate Operating Budget expenses totaled $973 million in 2006, including $961 million for ongoing operations and $12 million for receivership funding. During the five-year period from 2002 through 2006, the FDIC's annual Corporate Operating Budget expenses declined from $1,189 million to $973 million, a reduction of $216 million, or 18 percent, despite the effects of inflation on the FDIC's costs. That reduction was primarily attributable to significant reductions in staffing as well as a steady reduction in resolutions and receivership activities resulting from the historically low number of bank failures. Salary and benefits costs represent more than 60 percent of the FDIC's annual Corporate Operating Budget. Because compensation costs are so significant, the FDIC has engaged in a continuing effort to realign staffing to reflect reduced workload requirements as it has moved past the banking and thrift crisis. Total FDIC staffing fell from 6,167 at the beginning of 2002 to 4,476 at year-end 2006, a 27 percent reduction over five years. As a result, spending for salaries and benefits decreased by 15 percent, from $737 million in 2002 to $626 million in 2006, despite an increase of 17.7 percent in the salaries of individual employees during this period. Two comparisons illustrate the FDIC's prudent stewardship of the insurance funds over the past five years. The FDIC relies primarily upon interest earned on the investments of the insurance and resolution funds for its operations. It is notable that the Corporation has reduced its operational spending even as the interest earned on the funds has increased significantly. As a result, the FDIC's annual spending has dramatically declined as a percentage of interest revenue on the DIF and the FRF. 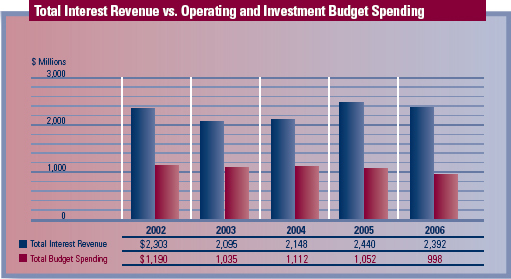 The aggregate interest revenue of the DIF and FRF grew to $2,392 million in 2006, while combined operating and investment budget spending fell to 42 percent of interest revenue, down from 52 percent in 2002. The Corporation's prudent stewardship of the funds can also be seen when operating budget spending is compared to the growth of the industry over the past five years. 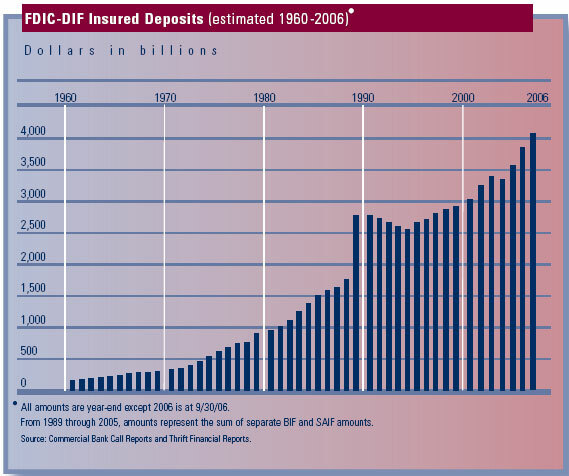 The banking and thrift industry's deposit insurance assessment base rose by approximately 39 percent during this period, from $4.6 trillion in 2002 to approximately $6.4 trillion in 2006. 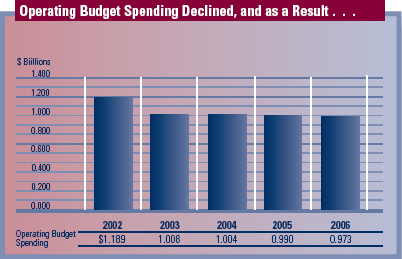 During that same period, the FDIC's operating budget spending decreased by 18 percent. 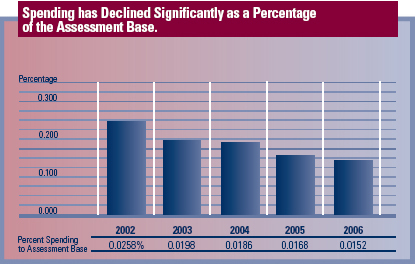 As a result, the FDIC's operating budget spending represented only 0.0152 percent of the average deposit insurance assessment base in 2006, compared to 0.0258 percent of the average deposit insurance assessment base in 2002. These comparisons demonstrate the good value provided to the banking industry through the FDIC's continuing commitment to prudent stewardship of the DIF. Although its staffing realignment was essentially completed in 2006, the FDIC will continue to emphasize control of spending in 2007 and future years. In December 2006, the Board of Directors approved a 2007 Corporate Operating Budget of approximately $1.107 billion, including $1.032 billion for ongoing operations. The approved 2007 budget is 4.6 percent higher than the 2006 Corporate Operating Budget. 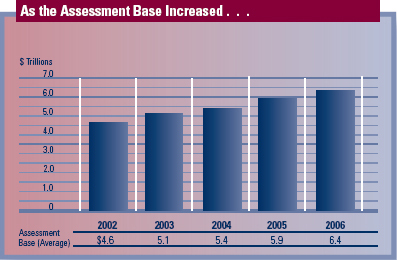 This limited budget increase was required for negotiated employee pay increases and included funding for a number of major new initiatives, including additional staff for compliance examinations and other supervision functions, as well as increased funding for employee training, enhanced IT security and privacy programs, and completion of system changes required to support the implementation of deposit insurance reform. The Corporation realigned its spending priorities and reduced costs in other areas to address these priority initiatives while limiting the size of the overall 2007 budget increase. In 2007 and future years, the FDIC will continue to rigorously review its workload and staffing and seek operational efficiencies through continuous improvement of its business processes. 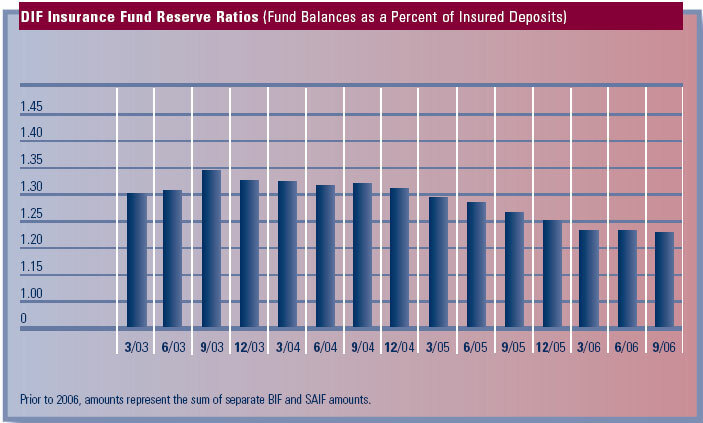 The FDIC instituted a separate Investment Budget in 2003. It has a disciplined process for reviewing proposed new investment projects and managing the construction and implementation of approved projects. Most of the projects in the current investment portfolio are major IT system initiatives. Proposed IT projects are carefully reviewed to ensure that they are consistent with the Corporation's enterprise architecture. The project approval and monitoring processes also enable the FDIC to be aware of risks to the major capital investment projects and facilitate appropriate, timely intervention to address these risks throughout the development process. An investment portfolio performance review is provided to the FDIC's Board of Directors quarterly. The Corporation undertook significant capital investments during the 2003-2006 period, including construction of a major expansion of its Virginia Square facility and the implementation of 11 major new IT systems. Investment spending totaled $222 million during this period, peaking at $108 million in 2004. Spending for investment projects in 2006 totaled approximately $25 million. During 2006, the Corporation completed both the New Financial Environment (NFE) and Virginia Square Phase II investment projects. In 2007, investment spending will total an estimated $19 million to $23 million. The Board of Directors approved one major new investment project for insurance determination, the Claims Administration System, in late 2006.